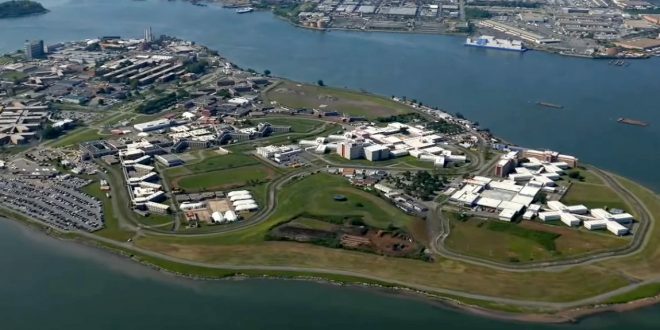 NYC To Replace Infamous Rikers Island Jail Complex With Small "Community-Based" Jails In Four Boroughs - Joe.My.God. New York City unveiled an ambitious plan on Wednesday to replace the notorious Rikers Island jail complex with four smaller lockups located in densely populated neighborhoods, including turning an Art Deco government building that went up in lower Manhattan in 1930 into a tower for up to 1,500 inmates. Mayor Bill de Blasio and other city officials said they envision more humane settings that would feature community space, ground-floor retail outlets and offices for inmate support services. “We’re taking a big step forward in the process of closing Rikers Island and creating a modern community-based jail system that is smaller, safer and fairer,” De Blasio said in a statement announcing details of the plan. Under the city’s vision, every borough would have a roughly 1,510-bed jail, except Staten Island. Inmates from that borough — currently about 250 — would be sheltered at the new Brooklyn jail, at 275 Atlantic Ave., the administration said. The housing cells would be designed to get more sunlight, offer guards better observation angles and provide space for programming, which would limit how often correctional staff must bring inmates through the halls to reach activities in other locations, according to Jeff Thamkittikasem, chief of staff at the city Department of Correction. “If you compare that to some of the older models that exist now — you have long tiers, with a not very good line of sight, some blind spots, you have to have officers walking down the tiers, as opposed to from a central location, looking around, being able to kind of monitor and have better engagement,” Thamkittikasem said.